November is your last chance to get ready to look your best for the quickly-approaching holiday season – and we’re here to help you do just that! 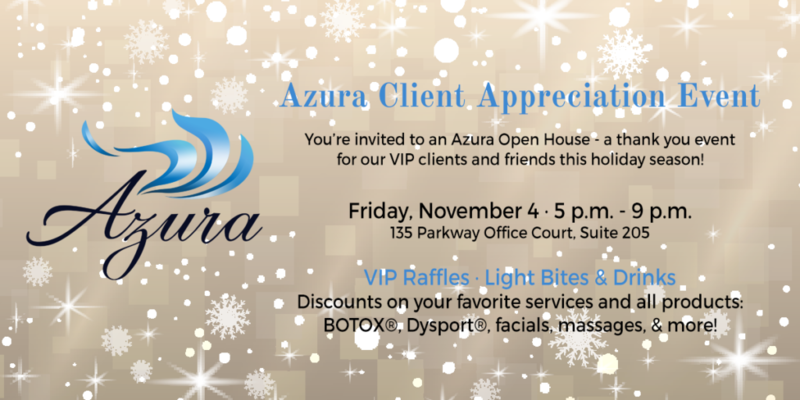 First and foremost, don’t forget about our Azura Client & Friends Appreciation Event on Friday night! We’ll have incredible offers, fun raffles, light bites, and festive sips for all guests… including big discounts on your favorite products and services. Get more details here and RSVP so we know how many guests to expect. Are you struggling with acne or do you have a teen at home who is dealing with all the frustrations that come along with breakouts and blemishes? Let us help you begin an effective treatment program so you don’t have to hide from the camera this holiday season. This month only, take advantage of special pricing on acne treatments – regularly $95, just $75 during November. For a longer course of action, try our acne-reduction light-based treatment. This is a weekly treatment that runs four-to-six weeks and is normally $150.00 per session – a total of $900 for six treatments. During November, we’re offering the entire six-week program for just $450. Read what Jennie Kowaleski, our resident PA-C, has to share about this innovative acne treatment in her latest Azura blog here! 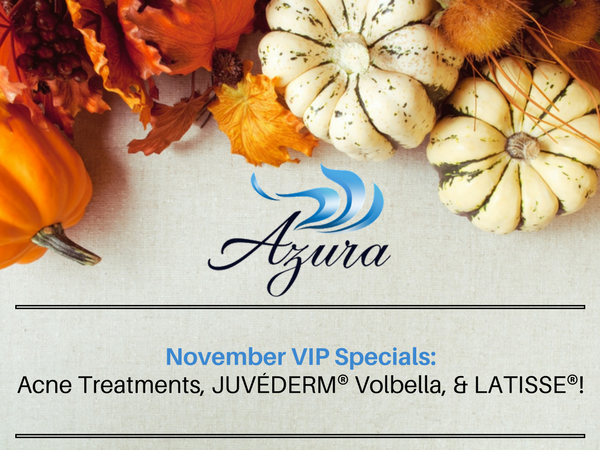 JUVÉDERM® Volbella XC has just been released and we have it at Azura! This version of JUVÉDERM® is indicated for lip augmentation and for correction of perioral rhytids in adults over the age of 21. This is for soft, subtle enhancement of the lips, not for large volume. Normally, this injectable is priced at $420, but this month only you can try this new formulation for just $360.00. As a member of Brilliant Distinctions® by Allergan®, you may be eligible for a $100 discount when purchasing any two JUVÉDERM®, BOTOX®, or KYBELLA® products. Ask us for details! LATISSE® is the first and only FDA-approved treatment for inadequate or not enough lashes. This product requires a quick consult with our provider, so be sure to request an appointment to discuss longer, fuller lashes soon to take advantage of our November special offer: Regularly $125 for one 3 mL kit… enjoy two for just $200! Tuesday – 9 a.m. until 4 p.m.
Wednesday & Thursday – 10 a.m. until 7 p.m.
Friday – 9 a.m. until 5 p.m.
Saturday – 9 a.m. until 2 p.m.